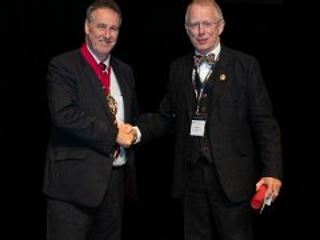 Mike Fardy has been awarded the prestigious 2017 British Association of Oral and Maxillofacial Surgery (BAOMS) Downs Surgical Prize at the 2018 BAOMS Annual Scientific Conference in Durham for his significant contribution to oral and maxillofacial surgery. He said that another thing he was most proud of, was the work in helping to set up the patient-led head and neck cancer support charity Faceup Cymru: “This has gone from strength-to-strength providing great support to patients, but it is a real challenge to get other colleagues to support it,” Mike Fardy added. Through his work with Cardiff Blues Rugby and the Welsh Rugby Union he has been able to promote Maxillofacial Surgery in Sport so that it is now an integral part of the medical setup at all major events.